As it was originally written for Cinema Parrot Disco’s IMDB TOP 250 Blog Series, this review is formatted differently than most of my work. 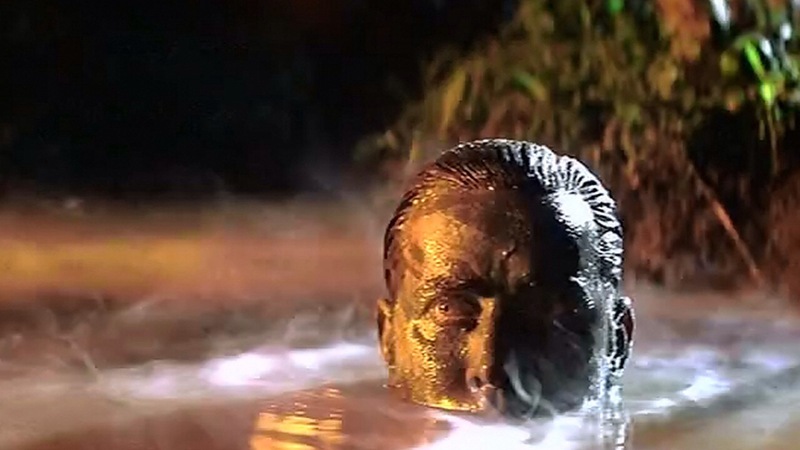 After returning to Vietnam for his second tour of duty, special-forces trained Captain Benjamin Willard’s (Martin Sheen) superiors order him to track and terminate Colonel Kurtz (Marlon Brando), a formerly decorated US soldier who has begun leading a cult that unilaterally executes those they call enemy. With the aid of Chief Phillips (Albert Hall) and his crew of navy personnel, Willard travels the Nung River en route to Kurtz’ compound, all the while growing more disenfranchised with the war. And also more psychologically unsettled. Frances Ford Coppola’s epic treatise on the Vietnam War needs little introduction, if only because those unfamiliar with the film’s content probably know the story of its creation, a fact that makes this movie as infamous as it is respected. To be sure, it is a quality picture, even if it is not perfect. 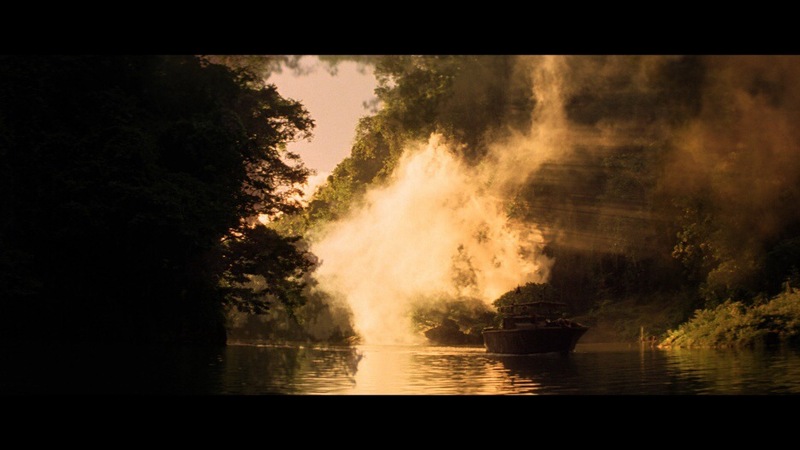 More than most films, Apocalypse Now is theme-based. Good thing that Coppola and Writer John Milius effectively portray the senselessness of war and the fragility of sanity. 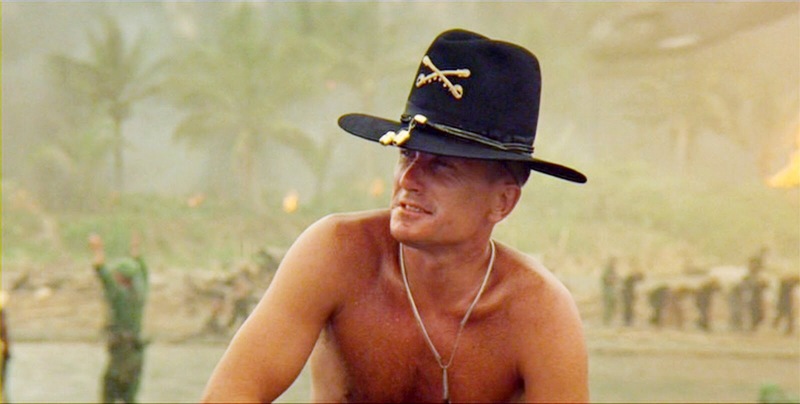 Between Willard’s mission, Colonel Kilgore’s (Robert Duvall) unseemly obsession with surfing, Captain Colby’s (Scott Glenn) men mindlessly firing their weapons into uninvestigated space, Clean (Laurence Fishburne) shooting civilians, and soldiers responding badly to a USO show, Coppola shows how war creates bad decisions. In his hands, war becomes descent into madness, whether it is Kurtz’ explosive variety, Kilgore’s obliviousness or Colby’s soldiers’ emotional catatonia. Perhaps most impressively, Coppola’s filmmaking technique, especially the audio, helps us understand Willard’s descent. Early in the film, the sound design is conventional. We hear the sounds of the characters’ surroundings as they shout to be heard, but as the movie progresses, the audio becomes increasingly psychedelic, until, eventually, Willard’s environment is almost silenced by trippy and disturbing rhythmic noise. 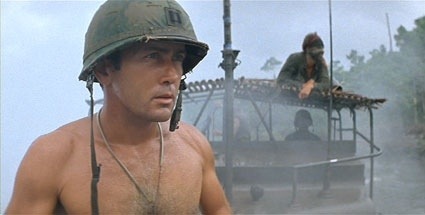 Apocalypse Now won an Oscar for Sound Design, and it is no wonder why. Sound is not the only technical element that proves successful. So does the movie’s cinematography. Few motion pictures use darkness and (almost paradoxically) color to blind both the viewer and the characters, to produce uneasy nervousness. In other words, Apocalypse Now is very well made. It is also well acted. Robert Duvall shines as a crazed combat commander, as does Dennis Hopper as a hyperactive photojournalist convinced of Kurtz’ greatness. Of course, Marlon Brando is disturbingly intelligent as the malicious Kurtz, while Martin Sheen admirably anchors the movie. All of which is to say that Coppola’s epic is thematically and technically successful. Too bad it is narratively flawed. Most of Willard’s descent, for example, is told through dry voice over, not shown through action or other character’s dialogue, a direct result of Willard’s status as observer in his own story. He spends most of the movie watching other people’s insanity, instead of doing things himself. Similarly, we frequently hear about Kurtz’ charisma, most especially from the Photo Journalist (Hopper), but we do not see it. We see Kurtz’ intelligence and ruthlessness, of course, but not the likability that causes his followers to treat him as their god. Unfortunately, telling not showing continues throughout much of the film’s narrative. Including with many of the side characters, none of which are well developed. Each has one trait, something Willard often describes in voice over. Ditto that for the consequences to many actions, including Willard’s choice to kill a wounded woman. He tells us that his companions now feel differently about him, but we don’t see their behavior change, really. 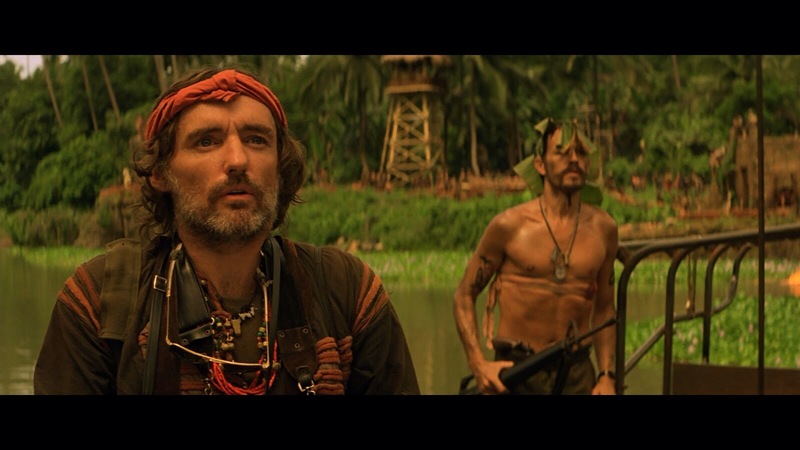 Finally, Apocalypse Now has zero notable female characters. While understandable given context, the absence of femininity makes the picture too macho. To be sure, none of the narrative flaws ruin Coppola’s film, but they do keep us at an emotional distance from the story. We are unable to immerse in the characters’ psychology and experience, a fact that means we never truly feel their struggle. Apocalypse Now is a masterfully made thematic film that accomplishes its objectives. Even still, additional focus on narrative and character development would have produced a more emotional, and thereby more moving, final product. I remember watching this in school, but I cannot remember which class. I liked it from what I can remember, despite falling asleep for some of it. When films used to play in class, I usually would use it as nap time if the cover did not interest me. I do remember the struggle with sanity that the characters had, with one, likely Duvall going through some incredible stress in a hotel room one night. Quite powerful stuff! Assuming I know the scene you mean, the hotel room was Sheen. And it was pretty powerful. I like it, too, on balance. I just don’t think it the greatest movie ever made, as some call it. B-? B-minuuuus? You’ll pay for this! On the bright side, my summary for that grade says the movie has accomplished its objectives and is therefore still quality filmmaking. Admittedly, it’s mostly because of the way it just drags me into this trance-like state. There’s something legitimately hypnotic about its effect on me. By the way, did you watch the theatrical or the Redux? Because B- is about what I’d give the latter, it’s bloated, meandering and loses the consistency of the theatrical masterpiece. I started with the Redux, whereupon I was getting that very impression. So I checked the interwebs. While thoughts on the Redux are somewhat mixed, enough people dislike it that I switched to the theatrical release. Honestly, I don’t disagree with you on the movie’s hypnotic qualities, or on how well it sets mood and tone. It is exceptionally well made. I just wish the narrative had been give a bit more focus, and the central character and Kurtz had been better developed. I’ve never seen this film nor read the book. I’ve heard great things however. But a little disappointed that the narrative is not that intriguing. This one is definitely more about atmosphere and psychological mood setting, two things at which it excels. Which means I can understand why many think it a classic. I just wish it would have focused a touch more on the narrative, too. Excellent review as always Josh! I want to watch this again sometime! From a technical perspective, it is worth a repeat viewing, that’s for certain. This is a master example of setting mood and atmosphere.